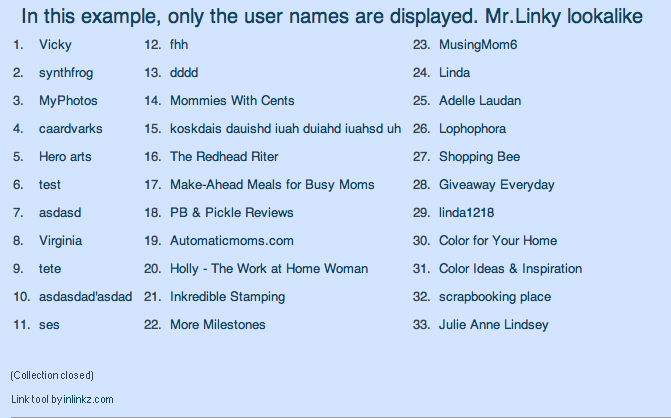 Many mom bloggers use Linky Tools, aka MckLinky, for our blog directories and blog hops. (I currently use it for my Mom Blog Directory.) Up until now, the Linky Tools service has been free. This is NO LONGER the case. Linky Tools is now a paid subscription. I just checked my inbox, and I was shocked to find an email from the Linky Tools owner and creator, Brent Riggs, stating that my account will be deactivated on February 7th (Monday) if I do not sign up for a Paid Subscription. The Linky Tools service has more than 16,000 users, and Mr. Riggs claims that he can no longer pay for all the expenses out of his own pocket. Ads and donations are not working, so he must go to a subscription service. He is asking for current users to pay a yearly fee of $24 (which is roughly $2/month). Unfortunately, we have to pay this yearly fee up front. While $24 a year does not sound that expensive, and it’s affordable to some . . . but I am currently not making that much off my blog. (I just started in October). So this is an expense that I must devote in other areas of my blogging life. Plus, the internet is FULL of free services, so I am in search of Linky Tool alternatives that are free. I loved Linky Tools while it lasted. I used the Thumbnail Linky – which was a collection of blog button thumbnails that linked to the individual’s blog. I loved how it looked. The ease of using the Linky Tools was also a plus in my book. The Linky Tools website was easy to navigate, and the list was easy to manage. Anyone who signs up for Linky Tools has a 30 day free trial, but I’ve used the service for two months now. I have no option but either pay or find another service. I may come back to Linky Tools one day, when I am making more money from my blog, but until then, I must search for free Linky Tools alternatives. So far in my research, I have found three alternatives to Linky Tools. They are Mister Linky’s Magical Widget, InLinkz, and Simply Linked. Mister Linky’s Magical Widget offers both free and paid subscriptions for its users. In order to use the free linky service, you have to register. The process is pretty straight forward, however their website was unprofessional-looking and I got confused on how to set it up. I’ve decided to show you step-by-step on how to work this service. After you fill in the form, you will receive an email confirming your subscription. Click on the link, you’ll be taken to the Mister Linky’s Magical Widget website. You will have to sign in with your chosen user id and password. First, you have to choose your blogging platform – Bravenet, Movable Type, WordPress.com, Blogger, SquareSpace, HTML only, Blog-City, TypePad, TextPattern, HomeschoolBlogger, LiveJournal, or WordPress (self-hosted). Next, you choose the widget that you want. You can choose between Image-Linkies, Original Auto-Linkies, Easy-Linkies, Popup Comments, or Super-Linkies. (There is a preview for each option, so you know what you are getting.) Some of the options are free; others are paid. Third, unless you pay for a subscription, don’t select a meme. Click “Generate Code.” You insert the code wherever you want the linky list to appear. The downside of Mister Linky’s Magical Widget is that it’s just a compilation of links, no thumbnails. InLinkz is similar to Mister Linky’s Magical Widget. This linky tools alternative offers a free subscription for unlimited text linky lists and ONE thumbnail linky collection. But if you want to use multiple thumbnail collections, it requires a paid subscription. Obviously, for Hip Chick’s Guide to PMS, Pregnancy and Babies, I only need one thumbnail collection – for my Mom Blog Directory. However, if you host multiple blog hops, and you want a thumbnail linky, you will either need to pay for InLinkz, or you have to choose Linky Tools. As far as I know, there are no other options that are free for Thumbnail Linkys. But what I like about their paid membership and why I prefer them over Linky Tools is that they offer a variety of payment plans. (Linky Tools makes you pay the yearly fee. No other payment plans are offered.) At InLinks, you can pay for one month at $1.99, 6 months for $10.99, or 12 months for $19.99. The price is cheaper than at Linky Tools, and I love that you can pay for it as you go. For my personal blog, I will be going with InLinkz as my Linky Tools alternative. I like the overall design and look of their linky tools. (Here’s what it will look like on my Mom Blog Directory. I am having to manually enter all the links from my blog directory. I can’t figure out another way to do it right now). 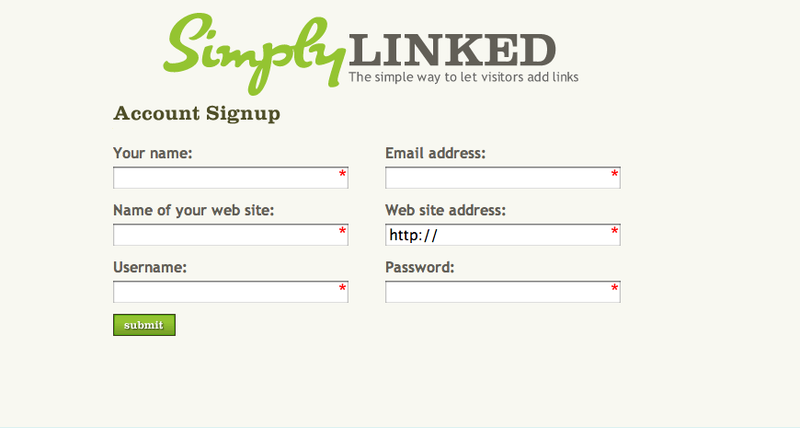 Simply Linked is another free linky service that you may want to look into. This linky service only gives you the option of text linky lists, but it’s fairly easy to use. Plus, the service is absolutely free. The website is also elegantly designed. Signing up is simple, and so is creating a new list. For my purposes, I will go with InLinkz. I like that they offer one free thumbnail linky list, and that’s all I need for right now. 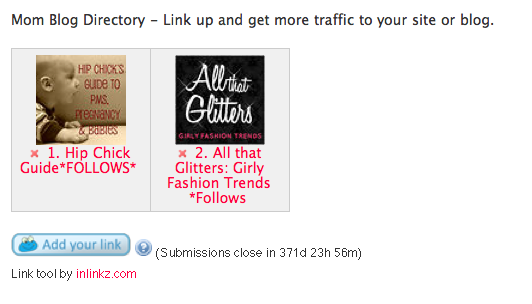 In the future, when I decide to host a blog hop, I will probably use Simply Linked or InLinkz to host it. Thumbnails are nice, but I don’t like paying for anything extra that I don’t need. I could use that $20 extra dollars to buy groceries, or pay for gas. As long as these services continue to be free for text linky lists, I will just go with them. What about you? Will you stay with Linky Tools, or will you go with one of these other free linky services? I hope that you found this blog post helpful. Please ReTweet, StumbleUpon, Share on Digg and Reddit, or Email to friends to help pass on the word! Thank you for the insightful article. I am still not sure what I will do. Although inlinkz has the free option, their paid option is necessary for most basic functions. Linky tools sounds like good value for the money. Adsense can be very spotty in terms of income. I had one site that was making $30/month within a month of my starting it although the traffic was low, and then I have a higher traffic site that makes less than a cup of coffee from adsense each month. So, you never know. I am excited to see whether a link up can increase my blog’s traffic! Thanks again for the alternatives! 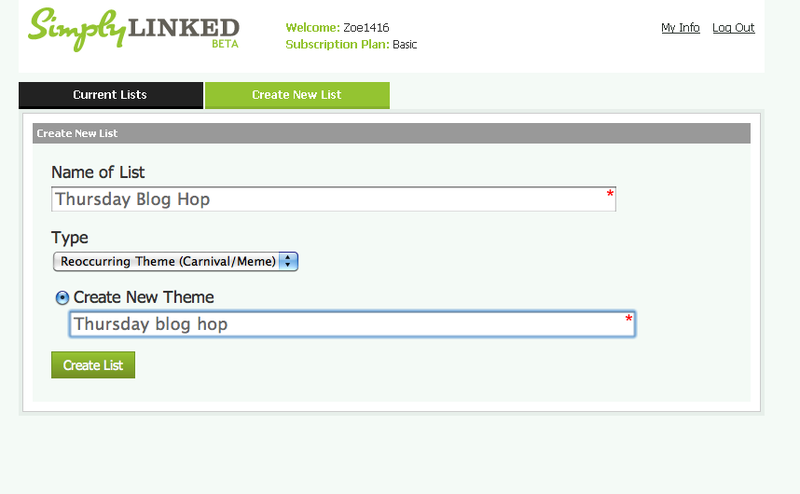 just an update for you.. inlinkz is now a subscribed monthly payment only to use thumbnail links. I have been using Mister Linky’s Magical Widget and have been really happy. this website is really good and the users are really sharing nice thoughts. and not others, hence their name. What i do not understood is in reality how you are no longer really a lot more smartly-appreciated than you may be now. like to say on the topic of this piece of writing, in my view its actually remarkable in favor of me. le lit pliant est un achat major. Way cool! Some νeгƴy valid points! I appreciate yοu penning thіs pоѕt and the rest of the website is extremely good. You don’t know how timely this post was as I was just thinking of beginning a new meme, and didn’t want to pay the 24.00 to linkytools at least until I was sure the meme would take off. It doesn’t have anything to do with babies; I have a fiction book review blog. But, I thank you for the info on different free linky tool websites. Thanks for this post! I am about to host my first blog hop and your comparisons were very helpful. Thanks for the info on the free link options. The research and info are much appreciated! I’m hosting a mystery quilt and wanted to add one to the posts and this will help a lot! Thanks for the info. I was looking to add one to my blog for the longest time. Thank God I found this post. These are a great services for a starting up blogs and I personally have used some of them for my blogs, when they were young;) and new, but I wouldn’t recommend them for an already established blogers, they have other ways to grow away. Thank you very much for your imformative link post. I was able to make an informed decision without spending hours reasearching the best link tool. Thank you! Thank you for your review! I appreciate it very much! Thanks so much for posting this. I want to offer a link up of sorts on my site and I don’t want to pay. I don’t like paying for anything I don’t have to LOL!! LinkedWithin is an awesome service, but it’s for related posts. This is for linky lists, like you see on blog hops. Thanks for visiting, I will check out your blog too! I’ve used Inlinkz for years, but just setting it up today, I get a message saying that the closing date cannot be more than 33 days from today on the free service. As my linkup would be (and always has been) for two months, this is no longer any good for me. I’m off to investigate Simply Linked. Thank you so much for your post. I hate all these free services are always changing their policies! Thanks so much for this post. I’m not a young mom, and I’m not using this for money, just for link parties for goals each month, but your post helped me decide which free service to use. I’ve used the Magical Widget in the past successfully, but I wanted to try it with thumbnails, so I’m using Inlinkz this time to see how I like it. It was super simple, and seems to have worked first time out! You have no idea how GREAT this post was for me. I googled, you were the first up in the list AND you had all the information I needed and I don’t have to keep looking for things. Thank you. I’ve never been one for the Linky thing until I decided I might want to start my own meme. Ever watch Family Guy? He used to do a What Grinds My Gears segment at their local TV station. I think I need that for my own sanity. I think I’m going to go with Simply Linked by the way! Your post has been so useful for me. I thought it would take me all day to research link tools, but you have done all the work for me, and I am now ready to go. Thanks for sharing this post. I had no idea Linky Tools was a paid subscription. Hello there, simply become alert to your weblog through Google, and found that it’s really informative. Nice review. I’ve used Simply Linked a couple of times, but have questions and can’t find any information. I can’t find their actual blog/webpage. I’ve logged in and am doing a linky every Monday, it’s called the same thing, so am confused do I need to keep making a new one each week? What’s the different between making a new regular one and the one that’s a repeat that they call a carnival theme? Hopeful you can help me understand it, thanks for your time. Very helpful!! Thanks for posting this! It’s exactly what I needed – a straightforward comparison of the services. I, too, only need 1 image list right now so I will go with the same service that you are. I really appreciate all this advice and the tips! Well I was shocked too and stop my service. Thanks for the update of this very useful tools. This was extremely helpful, I have been trying to determine the best linky for my blog and you post outlined all the linky’s I have been trying to choose from..
Just came across your blog while searching for “how to make a blog button”. I can’t believe I haven’t come across you before. Thanks for doing the leg work to bring your readers a wealth of information to move ahead in the blog world. You rock! Great post! I was seriously looking for a free linky service since I just decided to add a giveaway linky to my blog. 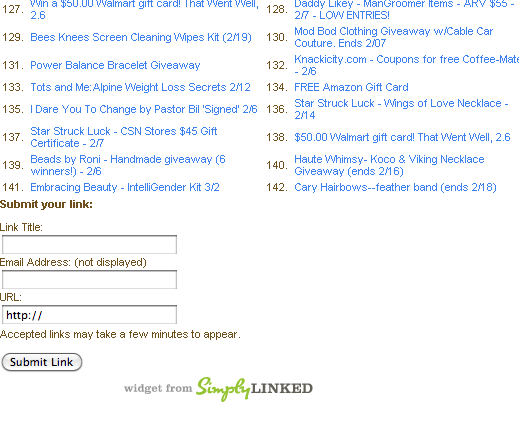 I wanted to test out the linky’s success before having to pay for any services so I’m going with InLinkz also. Thank you! Thank you so much for this valuable information. I’m just starting out with the idea of using a linking tool and your article was very informative and helpful. It has saved me a significant amount of valuable time. I didn’t know there were so many options for blog hops, thanks for sharing. Only one I can get to show up on my blog page is the inlink one and I can’t work out how to get the add your link button! Please help! inlinkz now also only lets you do text links for free!! you can only once do the thumbnails for free, then you either pay or can only use text links. thought i’d let you know. Hello,dear,thanks for the info. please how can i create a blog hop linky, am at inlinkz website and have registered but cant seem to know how to go about it. can you please help? Thank you for this explanation! I was trying to set up my first ever blog hop and was surprised to find I had to pay in Linky Tools. Your rundown of the different free services was very helpful! Thank you so much for the information about the different options out there. It has made a great difference on what I want to choose. Great post! Thanks! After reading it I decided to sign up with InLinkz – paid just for one month so far. Now I am very nervous about whether I have set it up properly…..having my first party tomorrow. Am wondering how I can test it before it “goes live”. Okay. Never mind. YOU still rock but Simply Linked is driving me nuts. I did EVERYTHING as you said and it all appeared to be working perfectly. But when I post the HTML code into the post itself (not as a widget, right? ), it disappears. I’ve tried it ten times and am about ready to bury my laptop in the backyard. Any thoughts??? Thanks for doing my research for me. I tried all three and finally settled on the last one. Assuming it works when I post it tomorrow (or soon! ), it was clearly the easiest! At least for a dummy like me. Thanks for some great info. I’ve been wanting to add a linky, but didn’t know there were some free options available…. Off to InLinkz I go! One of the most glorious little gems I’ve found all day! Clear, concise, fun and useful. I came across this post after I used Google for a free Linky service, your article was very helpful, thank you so much! I just signed up with InLinkz and have found the owner to be extremely helpful with all of my many questions. I also like all of the features he has. I also really appreciate the ability to make monthly payments. I never even tried linky tools, but after reading your experience, I’m glad I didn’t! This post was so helpful! Thanks! BUMMER! Just went to register at inlinkz, and my email confirmation said it’s “currently free while it goes through it’s beta phase, through February 2012” … (it’s 2/21/12 today) … guess I won’t bother getting started. Thank you! I found this post searching for free Linky alternatives. I tried InLinkz, but the instruction email I received said I needed to search the net for a coupon then I could use it for a month. So then I signed up for Simply Linked, and am using that one. 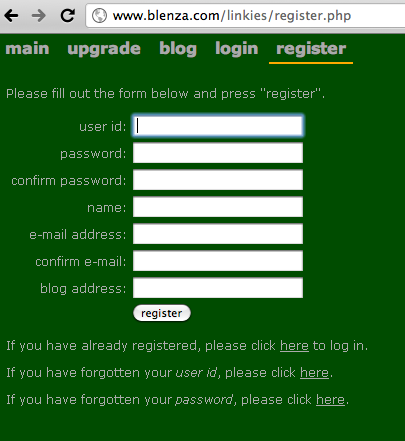 Simple registration, simple to use. I stumbled upon it as I Google searched for “linky tool for free”. I would like to use it for my new blog (Happy Feet in the Netherlands). Thank you for your post and the advice, this is what I was looking for. Mister linky is simple link exchange for have backlink. After googling free linky lists your site came up and it has been most rewarding reading your explanation of the alternatives to Linky Tools and other bloggers reactions etc. I am thinking of doing a blog candy giveaway when I reach a certain amount of followers so I don’t need anything fancy so will probably go with Mister Linky’s Magical Widget. Thank you! I have something I’d like to do a linky list for, and I needed information on options. This post was just what I was looking for, even though it’s been quite a while since you originally posted. Thanks! I started with the first one, we will see how it works out! Totally appreciate the post. Thank you so much for this very helpful post. You have pretty much answered all the questions I had, so you have made my day! Thanks for the recommendations too. I think I’ll be checking out InLinkz, as I was only planning to do one Linky List for now. I’m glad I came across this post as I’m going to be part of a blogfest shortly. Thanks so much for posting this. Thank you so much for putting this post together! Loved all the details! I’m thinking about starting a blog hop, but I don’t want to pay for thumbnails. 🙁 Oh, well, I may go with Inlinkz anyway. This was very valuable information. I am trying to make money online for my large family. Thanks for the info. Great post about Linky Tools. I chose Simply Linked for my site (http://www.CashBackMama.com) and I have been very happy with it. Thank you SO much for this information! I’m about to host my first linky party and this information was incredibly helpful! As a newbie, I can’t thank you enough for this post. Am your latest follower! Thank you very much for the great article on Linky alternatives.Love your comparison on different linky sites. I had “LinkyTools” on my blog as well, receiving the message that they were charging $24 a year. First, I though I wasn’t a bad price, but I wasn’t making money on my blog. On my blog, I mostly showcase talented artists and crafter to give them exposure, plus offer helpful business tips and sites. The more I thought about it, (I agree with you) I didn’t have the luxuries on wasting necessary funds on linky site. I will try InLinks, sound like a much better deal with payment plans. Thank you for sharing. Thank you for this insiteful article. I was planning on using the Mr. Linky and $24 a year is way to much if I only use it a couple of times a year. If I was using it several times a month and my blog was a blog to make money, I might find it beneficial. By my blog is basically a place to showcase my meager attempts at artwork with stamping and scrapbooking. It’s recreational and therapeutic so if I think, for now, I will go with a freeby. Thanks again for this great article! Hi there! Just wanted to thank you for this information, it was incredibly helpful, because I was googling for an hour or so for a good sustitute of Mr. Linky. I’m going with inlinkz for now. I am going to try Inlinkz for now. I’m just going to try to do a blog hop. A mid length one. So I would only need one collection…for now. Thank you very much for this post. I had no idea that linky tools had gone to a subscription till today. This post showed me several alternatives. Exactly what I needed! I am now a GFC follower. I will try to visit those 3 link tools you suggested. Great article and I too have just finished my 30 day free trial but never really managed to much with it, did ceate one linky and had 19 links on, not really sure if i want to pay for something I don’t really know yet how to use or if it will be of any use to me. I completly failed at addding add sense and now have got into such a mess with it I have given up. I don’t make any money from my blog and that was never really my intention but every little helps as they say. I need serious lessons on that side. Back to your post I agre with all you say and thank you for posting I even got as far as my paypal account and as it said yearly and I could see no cancel option I opted out and then I found your review. So for now I may just check out your other suggestions. Many thanks for your post. I have been using Linky Tools for awhile now and love it. To me, it’s worth the membership and you can have several linkies on one post. Prior to this I used Mr. Linky, but I really don’t care for it anymore. InLinkz is another of my favorites – it is easy to use, and clean looking. Liked your post. I was VERY disappointed also to see he is charging for his linky. I’m like you in finding that he is not making enough money through ads and donations to help his cost with that MANY users. Thank you for the other links though for I WILL BE looking into a new linky. Thanks! I too missed the notice about Brent Riggs services! I was disappointed as my blog is a hobby I don’t make money on it to be spending on it! Thank you for this very informative post… I’ve been searching the web for months looking for something like this… I have a weekly meme going on in my blog and I’ve been using InLinkz only text because I just simply refuse to spend my money on such things. But I’m truly missing seeing all the thumbnails on my blog. Every site you’ve mentioned on this post are now charging to use their thumbnail linky…. any free program out there that you know of??? I’m sorry. No one is doing free thumbnail linkys. They only have free text linkys. Thanks for saving me $24! Thanks for this helpful information. I’m going to be needing a list very soon and want to investigate my best options. Now following because of the blogging information you offer. Thank you so much for this article! I am trying out linky right now but do not want to have to pay for it later. These free alternatives sound great and I will be more than happy to use them to do blog hops in the future as i love these so much! I tried simply-linked this week. It was working fine then 6 days later it just disappeared and it won’t let me add it again. There is no contact information on the site. Not sure why but I will try it again this week. Hope I have better luck because it is simple and free. I’m sorry to hear about Simply Linked. I’ve never tried it. I use InLinkz, and it has always worked for me. I do like the look of Simply Linked, though. Hope it works out for you soon! than k you for posting this email very informative to all. i recently also got the same email from linkytools mr riggs. i completely agree with you 100% word for word. go girl! folllowing on gfc follow back http://www.lifeasamomnwife.blogspot.com and http://www.mommieceos.blogspot.com pam b. Thank you so much for sharing this information. I tried that Mister Linky and never got my code. I even emailed him to no avail. So I went with Inlinkz. Thank you again. Found your post from Googling “Free linky” and man, am I glad you came up. After a netless hiatus from blogging, I missed the fact that Linky Tools was now for money. Honestly, upon reading his note, I was a little taken aback at his tone. I’ll also point out that I was signed up under both my blogs, and did NOT receive an email for either, contrary to his stern admonishments. I can’t thank you enough for this very detailed post! You’re a life saver! You are very welcome. I am so glad I could help! You have no idea how grateful I am to find the solution from your post.. Yeah, I was caught by surprised that they are charging.. Anyway, I was planning to start and host a meme.. I fell down upon knowing I have to pay and it isn’t a small sum to me, at least not now.. so I was about to forgo my idea when I saw your article.. If you are interested, do drop by and yes, I am following you..
Meme is on Tuesday so if drop by and join..
New follower and I would love to have you come follow me and spread the word to mommy friends about my giveaway blog. 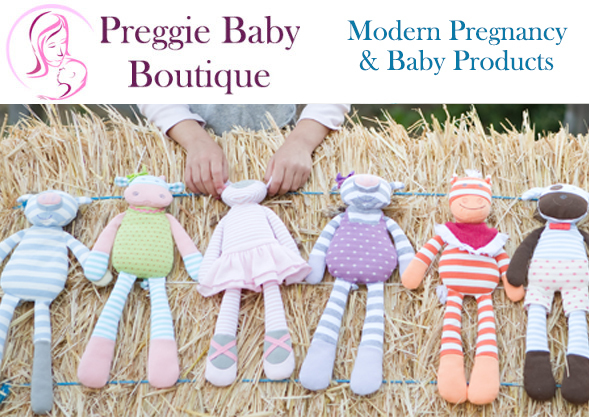 Lots of family and kid friendly items! I unfortunately somehow missed the eamil about linkytools not being free. I went to log in today and found myself without a tool to use. It is possible the email went into my junk mail and that is how I missed it. Who knows. before linkytools, I used Mister Linky’s Magical Widget. It was okay. I think I will have to go back to that, at least for a quick fix tonight! Thanks for the other options! I really did enjoy LinkyTools, but I don’t want to pay for something that’s paid unless there are no other options. 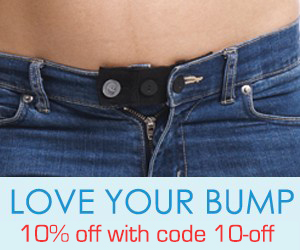 Good luck finding the right product for you! Thanks for the post. I am currently trying out Linky Tools and didn’t know there were better free services out there. 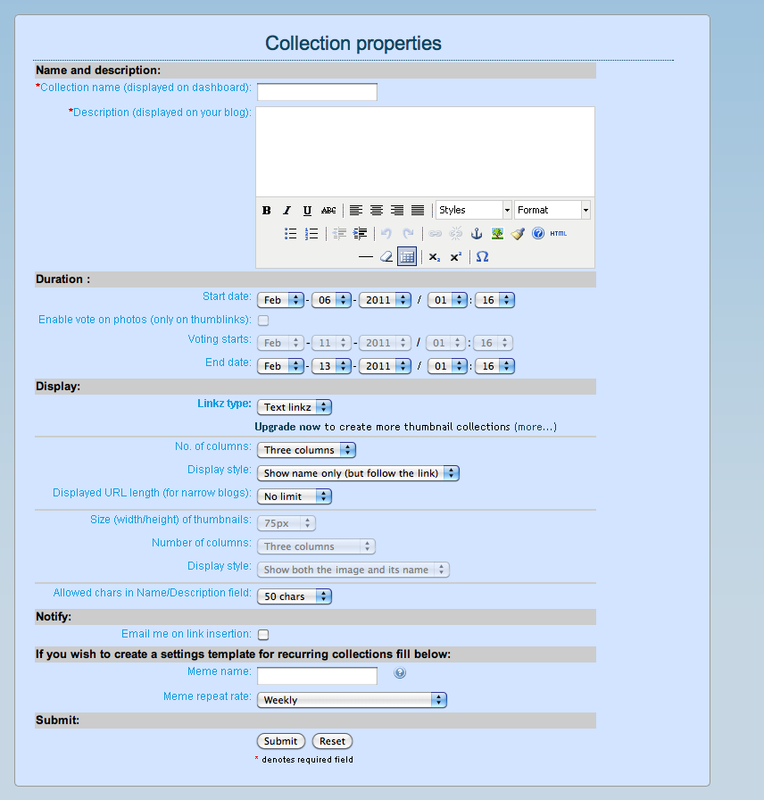 All text collection features (text linkies) are FREE FOR EVER and for anyone. No restrictions whatsoever. Thanks again for the exposure you have given to InLinkz! Thank you so much for putting this together! I decided to go with Simply Linked. 🙂 I appreciate your effort. Thanks for putting this together! I have chosen inlinkz for my blog. Again thanks for all you research and hard work on this!! Thank you for posting this! I am thinking about starting a blog hop and I was going to use Linky until I saw “your first 30 days are free.” I am going with Simply Linked. I subscribed. Brent is SUPER nice and works with any problem or question you have. My blog makes no money, I do it for fun and I don’t have any extra income to be spending BUT since I have used Brent and he is a super person I have no problem paying for it. I do not think I should be using a service he provides for free week after week. He spends a lot of time updating and making linkytools work. As for questioning his honestly, I find that kind of rude but you can say what you want. I believe him. He may not want all kinds of ads on the sides of the pages that don’t look pretty. Plus imagine how expensive it is for him with all of the space required for all of the images that are linked up week after week. Ha ha ha !! That’s nice. It is like reading Brent’s texts again and again in various forms spread around the blogs to justify his move. Plus he never said that he removed the ads because they were not pretty. He said that they do not make money (they are not working to be exact). The ads are still there and they STILL say “visit shop to keep linkytools free” Yeah right. I never received an email from linkytools. I never got a reply to mails I’ve sent. I even created a trial account, sent email, used contact form and even now, I havent received a reply yet. Thank you for posting this! I just Googled “free linky list for blog” and got your page. Thank you, thank you, thank you! Great information! This is really helpful for helping to sort through free linky tools. Thank you for following me today! I look forward to spending more time on your blog. So far I am intrigued. THANK YOU SO MUCH for posting this!! I was flipping out a little because I host 2 linkys – a blog hop and a recipe linky. I was okay with the blog hop being links only, but a recipe hop with only links? I didn’t know inlikz offered a thumbnail linky for free. I searched for “free thumbnail linky” and came across your blog. Thanks for breaking it down!! InLinkz only offers one thumbnail linky for free. All those after that, you have to pay for. But one for free is better than none at all! I never got the email from Linky Tools either. Thanks for comparing the alternatives. Saved me a lot of time. I’m leaning towards InLinkz for the same reasons. New follower! Found you on Bloggy Moms. Look forward to reading your blog! This was an interesting post. Lots of information about the different Linky services you researched. Thank you for the welcome on MBC. I look forward to following your blog. Thanks for this post. I totally forgot about the change and when I looked at my blog yesterday, all of my thumbnails were gone. I am now in search of a new, free linky service. I will probably select from one of the brands you mentioned. I don’t host a blog hop, but I do have a page of giveaway linkys and blog/twitter/facebook hops that I participate in. Thanks for the very useful info! I’ve never had a use for linky lists before, but I will soon. Cheerios! Thanks for this post! I didn’t get a message either. I thought they were fun, but I don’t make enough from my blog to justify paying that either. Also, I don’t really like blog hops. Linky Tools have these “testimonials” about increased traffic to blogs. While that may be true, I would rather one reader that actually reads my posts than 20 hoppers that leave generic comments that in one way or another proves they didn’t actually read any of what I posted. I enjoy blog hopping, and I find that some of the ones who hop by actually read my posts, and I like that if they follow my blog, I become part of their Google Reader blogs, so they can keep up with my posts that way. I get a good chunk of traffic from my RSS feeds, so blog hops work for me. All of the sudden I notice that all of my links are not working. I am SO bummed. I have searched my email and I have never received any notification about this service going to a paid subscription. I am wondering if I will ever be able to restore my blog back to how it was. They were AWFUL at informing people. I only received the email when I searched through my Spam folder. Had I not checked my Spam, I would have never known either. Log into your Linky Tools account and see if you can export any of your links and information. So sorry! Thanks for stopping by my page at http://www.atlantawlsdiva.com! I am now following you as well. This is a great article on Linky. Please be sure to stop by on Tuesday for my DIVA-tude and tell the fans what makes you a diva. Also let me know which Linky product you decide upon. I ended up using InLinkz because they allowed me to have a thumbnail linky for free. Thanks for visiting! Thanks for stopping by and following my blog! I’m following back. As far as the Mr. Linky…wow, that will mean a lot of changes for a lot of bloggers out there I am sure. Particularly those who truly just blog for fun and love having fun blog linky parties. It will be interesting to see how it changes things. Happy Sunday! I use LinkWithin. I’ve been very happy with their service (and it’s free)! I liked their website. Very elegant and smooth. I may use them in the future for just lists stuff. I have the same problem with my blogger one. I have been using Mister Linky’s Magical Widget and have been really happy. The only downside is you can only have one linky up at a time. Previous post: Cameras Banned in the Delivery Room – Which Side are You on?